Entomologist Shaun Winterton discovered a new species of green lacewing in an unusual place: on his computer screen. Thanks to one man's love of taking nature photos and Winterton's love of looking at pictures of bugs, this little guy has been added to to our catalog of known species. Photo by Guek Hock Ping. Winterton was browsing pictures of bugs when he stumbled across a sight he had never seen before: a green lacewing with black lines and blue spots on its wings. Guek Hock Ping, a nature photographer, had taken the picture while in Malaysia. 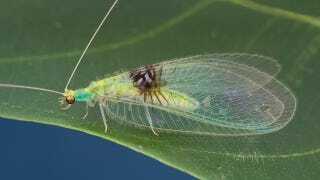 After Winterton sent the link around to his colleagues, who were also unfamiliar with this particular lacewing, he got in touch with Guek. A year later, Guek was again in Malaysia and was able to capture a green lacewing specimen, which Winterton was able to confirm was a previously undiscovered species. The bug has been named Semachrysa jade taking its species name from Winterton's daughter. I hope Guek got first refusal on the naming. This incident points to the power of image hosting services as image crowdsourcing. Guek took the photo in Malaysia, but didn't have the expertise to identify it as a new species. Winterton was likely in California, where he works as a senior entomologist at the California Department of Food and Agriculture. But thanks to Flickr, they performed a completely unexpected collaboration. Now they're co-authors on a paper appearing the latest issue of ZooKeys, describing this green lacewing and celebrating a victory for citizen science.